Project obstacles and solutions: For years there had been a water flooding problem on College Avenue between 19th and 25th Streets in Terre Haute. Poor drainage caused rainwater to pool in the parking areas on this residential street. Heavy rains caused the water to flood the driving areas as well. This water would stand for days. The Terre Haute Sanitary Board had a dilemma. Building new storm sewer lines are costly. Retention ponds were not an option in a residential neighborhood. They investigated using pervious concrete. Pervious concrete allows water to run through its surface into a stone subsurface area until the water drains naturally into the soil beneath the pavement. It is recognized as a green building solution for water management. The Sanitary Board, along with the City Engineer, made plans to tear out the old pavement, curbs and walks and install pervious concrete to handle the water. This was the first time the city had attempted to solve a water runoff problem with pervious concrete. ST Construction provided the paving for this project. The plans called for the parking area on both sides of the street to be poured with pervious concrete. ST Construction used 712 yards of imix Eco Pave pervious concrete for these areas. They slip-form-paved chairback curbs to channel water to the pervious areas in the parking lanes. 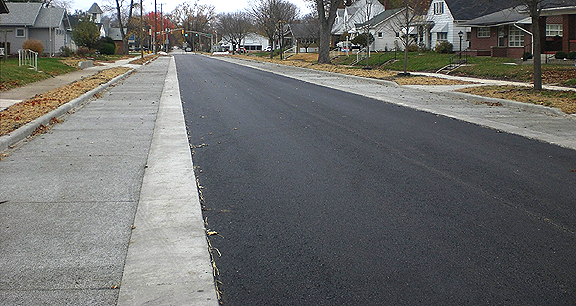 The rest of the street was constructed with asphalt that was crowned to the parking lanes. This project was successful in eliminating the water pooling problem along College Avenue. The pervious concrete provided a green solution to the water issue and did not require a new storm sewer to be installed. It was awarded the 2012 IRMCA Award of Excellence for Stormwater Management. For more information on imix Eco Pave, click here. To see other case studies using imix Eco Pave pervious concrete, click here.